Cruciferous vegetables, such as broccoli, cabbage, brussels sprouts, cauliflower, and kale are some of the healthiest vegetables you can grow. The health benefits are almost too numerous to mention, but they can help prevent cancer in more than one way, and they can even help fight cancer, literally. Regular readers will know I’m a fan of science, so this isn’t just holistic hearsay, there are actual peer reviewed studies showing these effects. They contain antioxidants, which can help prevent cancer by removing oxidative stress on our cells. They also contain relatively unique compounds that help our cells detoxify, thus removing potential carcinogens from our body. Then there is another compound that can literally cause cancer cells to kill themselves. They’re also good for preventing inflammation, and can lower your cholesterol. Cruciferous vegetables are superfoods, some more than others, kale would seem to be more than others. But this isn’t a health blog, it is a gardening blog, so lets talk about gardening. I’ve grown cabbage, and it works, but critters get into it like crazy. Slugs, ground hogs, rabbits. When it gets damaged it ruins the head, and you have only 1 head per plant. Plus, cabbage is has a little less nutritional density compared to the other cruciferous vegetables, and it is really cheap at the store so why not just buy it? I always try to consider cost when planting something, since I have limited space, I want the most bang for my buck. I’ve grown brocolli, but it takes a long time to grow, needs sun, and has a very specific harvesting window. You have to harvest it at the perfect time when the florets have formed, but not formed too much. If you wait it gets really bitter. You also have some critter risk, if it gets damaged prior to full maturity, there isn’t much you can salvage. I’ve grown brussels sprouts, and they took a really really long time to grow, and there were some critter issues, but mostly they tasted horrible. I guess I did it wrong or something, but they were so incredibly bitter, we couldn’t eat them, and we like brussels sprouts. I cook them a couple times a week – but I buy them at the store. I’ve tried growing cauliflower, it also takes a long time to form, and you have to do things like tie up the leaves over the head, sounds like work. I have never had to do it though because my plants have never gotten heads. Then I come to Kale. Kale grows very fast, because you’re not harvesting a flower or a fruit, you’re harvesting mere leaves. You can harvest it all through the growing season, taking leaves as needed, while letting the plant live to keep making more. Critters like it just as much as the other ones, but if they eat a leaf, no big deal, there are more. If a cabbage looper eats a hole through the leaf, no big deal, there is more leaf left. I rarely harvest a leaf without a hole in it, but it is still good. The other ones all produce a single head (more or less) per plant, and if it is ruined, it is ruined. But Kale plants can produce dozens and dozens of leaves. If you plant a row of brocolli you best love it, because you’ll be eating it nonstop when it is in season. But if you plant a row of kale you can harvest it all summer long, even into fall since it will tolerate cold and frost. For the home gardener who has only limited room, that is very efficient. Due to the wrinkles in the leaves store bought Kale has a reputation of holding onto pesticides, but at home you can just not use them (and again, who cares about a little leaf damage, so long as the plant keeps producing). So that is another reason to grow at home. So you think, fine, I can grow it, but what would I cook with it? I love Kale because it is so versatile in the kitchen. You can add it to anything, it even holds up very well in soups (as anyone who has had Olive Garden’s Zuppa Toscana knows). I add kale, chopped up, to the following: any casserole, any soup, eggs, stirfry, sloppy joes, any pasta dish, pizza, macaroni and cheese, any skillet dish. It is great for kids who don’t like vegetables because you can just sneak it in. For all these reasons, kale will always have a place in my garden, and I recommend you put some in yours too. Kale greens are easier to grow than mustard greens and I find that it’s easier to cook and have a sweeter taste than mustard and collard greens. This article was so interesting and informative! I am wanting to start a garden and kale seems to be a good choice. Also, you’re a wonderful writer! Your readiness to admit difficulty lends approachability and comedy to your writings. Thank you for this article; I am looking forward to reading more! There is nothing wrong with talking about health. Isn’t that why most of us have gardens in the first place. Years ago when I thought of Kale, I thought of a simple garnish. With all of the health benefits of Kale and its simplicity in growing it, there is no reason why Kale should not be a part of my garden. Thank you for bringing this message to us. I agree, Kale is an amazing and easy to grow backyard green. I grow a few plants each fall/winter in a raised bed. I even cover the bed with a small PVC and plastic hoop house to protect it during the coldest winter months in Virginia. The little added protection means that it grows all winter, and I get to eat it all winter. Easy, tasty, healthy, a must-grow. Thanks for your great post. Great post. I’m currently working on an indoor garden for the winter months and I’m really enjoying your insights. I found growing kale was a great cost effective way of feeding our Iguana, “Ceasar”! 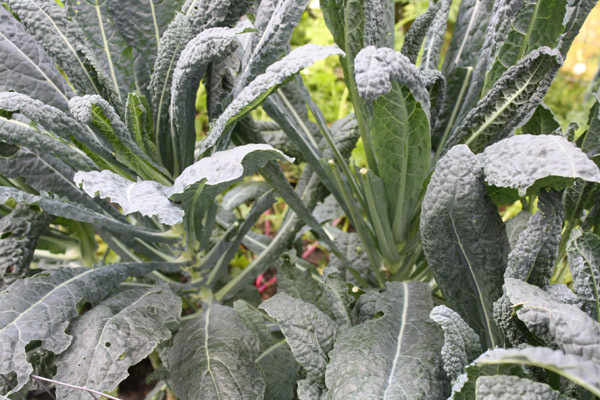 Kale is something that I’d like to try for a winter garden project using cold frames. I love kale and grow it every year. Another favorite is Swiss chard it can be harvested all year also. I saute it with garlic and mushrooms in a little olive oil and it makes a wonderful side dish. I like your blog and I am really glad I found it. garden veggies are awesome. i like to juice kale. its super good for your skin. Green Juice 1: 1/4 of red Cabbage, 2-3 stalks of Celery, 4-5 leaves of Kale, 1 Lemon, 3 Apples, little amount of ginger. Thanks for the article. We use Kale every time we juice – which is daily. I’m going to grow our own starting this next spring since I have had to pay up to $2.99 a bunch! I would like to grow different varieties of Kale. What are less expensive ways of finding different seed sources? I enjoy the energy stirred up about gardening and re-starting life each time we plant. I tried broccoli, cabbage and cauliflower last year and decided the only one worth the garden space and effort was the cabbages. However, for those who do grow them, the leaves of broccoli, and cabbage (not sure about cauliflower) are also quite edible. Once the heads are picked you can still pick leaves to mix in with kale, chard, or other greens and get the most harvest possible from the plants. I love Kale!!! It’s great for the skin. I really want to try and grow this in a winter garden. I’m a new fan of Backyard Gardening. Great Blog!!! I should have planted kale this winter instead of cabbage. I hadn’t grown kale yet (as it is new to me) but the first time I tried it, it instantly became one of my favorite veggies. Reading this article made me decide that I will definitely include kale in my coming spring gardening. Kale is great but I want to comment on your fun with Brussel Sprouts. You commented that they tasted bitter. Did you wait until after a frost to harvest? my experience is that Brussel sprouts taste bitter until frostbitten, they can even stand a mild freeze.The muld freeze ruined the outer layer of leaves but the inside was one of the sweetest sprouts I have ever tasted. I love kale! It always seems to self seed, so I get little kale patches of the krinky red – need to try the dinosaur kale! And add vinegretee when it’s done.! If I’m cooking itinerary a soup or stew, I add it early enough to cook ~ 45 minutes or so! Great blog! Thanks for this nice little article. Frankly, I love kale. Yes Vern I know that frost can sweeten veggies like sprouts, however I did not wait for frost. There is a reason, the sprouts would have ended up too big, maybe I planted them too early, but they barely had time to mature anyways, and had I let them go longer they would have gotten far far too big. So it was a late harvest, but not quite late enough. I am so glad to have found others who love Kale as much as I do. I have grown it every year for five years…. since I was introduced to gardening at the age of eleven. I plant i every year and it will have a place in my garden for many years to come. P.S. love your blog and writing style.This is my first time here and I will be sure to return regularly. Great post. I was considering growing cabbage, broccoli and sprouts, but I think I’ll go for kale now instead. I’ve never even eaten it before, but it seems like a good thing to try growing. I agree with you about kale. I grew kale and cabbage last year. I had kale all season and into the fall, with the cabbage, not so much. I will probably give kale the cabbage section this year since it’s much more versatile. But don’t give up on Brussels Sprouts. Try this: As the buds (sprouts) come in harvest the leaves. Removing the leaves allows for growth of the sprouts themselves. I harvest leaves every time there is enough for a meal. They are tender, sweet, and delicious!!! When the sprouts are 3/4 to 1 inch, harvest and cook. They should be just right! All articles say kale wants to grow in cooler weather but here in Atlanta it is featured at the Botanical Gardens. Southerners eat a lot of kale. Does it really do just as well in the South? Thanks. A great recipe from my garden to your table. Grab some Kale, a handful, an onion, 3 or 4 tomatoes (any variety), and a small zucchini (8-10 inches). Pour a Tbs or so of olive oil in a frying pan and put in some chopped onion, then peal and thin slice the zucchini and add to the frying pan with the onion. Now chop up the tomato and add to the mix. Strip the Kale leaves off the stem and scissor cut the Kale in to little bitty pieces and throw on top the onion, tomato, and zucchini. STIR. Adjust the heat on the stove to simmer the veggies and let the tomatoes boil down, stirring all the while to soften the zucks. Top with some Mozzarella or Parmesan Cheese. Serve. Eat. Enjoy. You can add whatever spices you like, throw in some bite size chicken, or use some other kind of squash. Be creative. But remember, the KALE makes this a great meal. I don’t use any exact measured amount. LET THE FORCE OF THE KALE BE WITH YOU. Love Kale, and live in the 115 + heat. My plants keep growing in fact I have a 3 year old plant. I picked the seeds, and saved them. Thanks for all the wonderful idea’s, I usually just juice or blend the Kale. Planted more this year, just in case. kale and saffron goes very good together in your garden, especially if you grow organic.